I found a box waiting for me yesterday. I had forgotten that I had ordered myself a gift for my birthday. I have been looking for an affordable dress form and found one at Etsy. Very fun to have it come on my birthday. 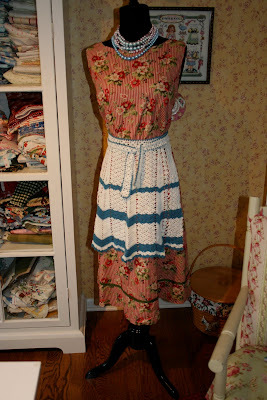 I put it in my sewing room with a vintage dress I found at the Junk Bonanza in Minn. in the fall. My Mom-in-law gave me the crocheted apron years ago and I had the fun pearls from one of my excursions. I can see that this little vignette is going to change often. 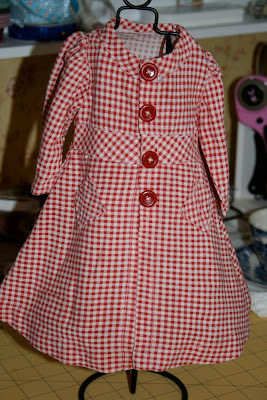 I also want to share with you the little doll dress and form that I bought last year at my friend, Nancy's store. It sits on top my fabric cabinet. I just think it's so cute! I hope your Wednesday is bringing you peace and blessings! I've always wanted a dress form, but never had room for one. I love the way yours looks next to your fabric cupboard. Won't it be fun to dress her differently from time to time. Now, I probably could find room for the doll dress form if I were to find one. Cute little dress on it too. Great birthday present to receive from yourself. What a very sweet gift to give yourself. :) Everyone needs one!